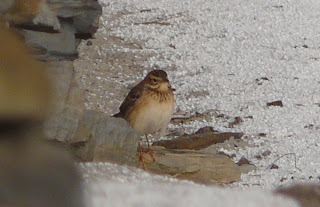 Cretzschmar’s Bunting, Buff-bellied Pipit, Collared Flycatcher, Red-flanked Bluetail, Spotted Sandpiper, Hume’s Leaf Warbler and 2x Pacific Golden Plovers are just some of the highlights of an excellent 2008 on North Ronaldsay. Despite such a list the island remains frighteningly under watched, so why not come and stay in 2009. Quiet as expected but casual sightings have included lesser redpoll, woodcock and 'eastern' chiffchaff on 27th and stonechat and common scoter on 28th. Also on this day was the unexpected and rare sighting of an otter at Stennabreck and again on 29th at Twingness. Up to 3 robins have been seen daily plus 2 song thrush, 2 fieldfare, up to 70 snow buntings and both male and female hen harrier. Late news from an islander was of 3 killer whales off Bewan on 22nd November. The only noteworthy sighting was the pretty amazing rediscovery of the presumed blyth's pipit at Garso on 24th, still no nearer to identification and present on the morning of 25th, the bird was trapped and proved to be a richard's pipit. A presumed BLYTH'S PIPIT spent a frustratingly short time sheltering on the golf course, showing pro blyth's plumage, behaviour and structural features but all too briefly. Other bits and pieces over the previous days included a Greenland white-fronted goose, a black redstart and stonechat by Nouster, single chiffchaff and woodcock and a few robins. Present throughout were the scaup and canada goose, whilst at the Observatory the song thrush remains and a water rail appears to be wintering in the ditch. Daily totals of robin and chiffchaff fluctuated between 3 and 4, and 3 woodcock and single stonechat and black redstart have been seen over the 4 day period. A juvenile glaucous gull was noted on 15th and a total of 255 purple sandpiper was a reasonable count, as was 27 dunlin on 16th. A few new arrivals on 16th included most notably a yellowhammer at Gravity, singles of greenfinch and common redpoll and a flock of 56 snow buntings at Twinyess. 3 grey heron were still in Garso Wick when last checked, 5 sooty shearwater were at sea on 17th and the male hen harrier made an appearance on 18th. It rained all day! The few notable migrants that were out and about included a black redstart and greenfinch by Holland, 2 chiffchaff, and 3 woodcock. A goldeneye was on Gretchen Loch and the female scaup was still present on Bewan Loch. Waders on the Links included 71 ringed plover, 79 sanderling, 11 dunlin and 20 bar-tailed godwit, and a hen harrier was at nearby Hooking. Singles of black redstart and stonechat were seen along the west side, and 3 common scoter flew past.2 robins were at Holland and other migrants still present included 2 woodcock and 6 chiffchaff. A sooty shearwater was seen on the sea and a scaup was on Bewan Loch. 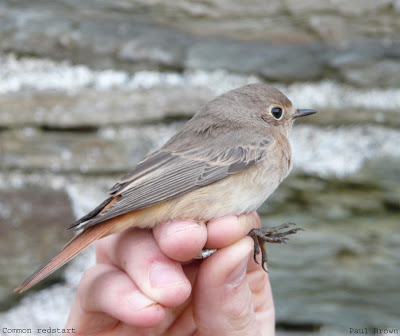 A handful of migrants today, including a very late common redstart at Sandback, black redstart at the Observatory, 2 stonechat, a blackcap, 3 robin and 6 chiffchaff. 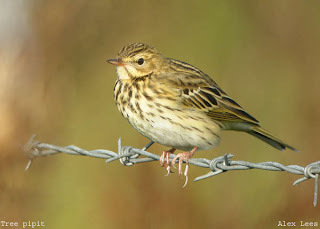 A lapland bunting was mobile at the north end, notable finches comprised singles of brambling, greenfinch and meally redpoll and thrush numbers had decreased to just 32 blackbirds, 44 fieldfare, 63 redwing and 3 song thrush. A juvenile glaucous gull dropped in briefly on Garso Loch, the canada goose is still at Bridesness and a count of 296 wigeon is the largest for some time. A juvenile iceland gull was amongst the many gulls at Bridesness, where the canada goose and 11 barnacle geese remain. 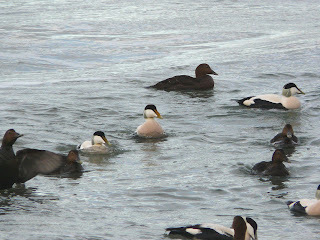 A common scoter was in Nouster Bay and 23 long-tailed duck and 8 red-breasted merganser were in Linklet Bay. A dunnock at Westness is amazingly the first this autumn, and other counts included a blackcap, 3 chiffchaff, a goldcrest, 9 robins and 17 woodcock. 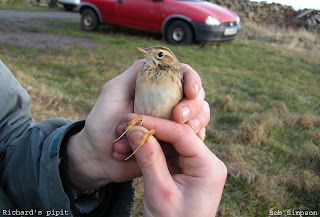 Thrushes consisted 5 song thrush, 119 fieldfare, 91 blackbird and 93 redwing. Today's few new arrivals included a black redstart, blackcap at Westness and a kestrel in the north, with a female scaup on Bewan Loch and common scoter in Garso Wick also of note. Leftovers of Fridays arrival consisted of 92 blackbirds, 81 fieldfare, 103 redwing, singles of song thrush and goldcrest, and 14 woodcock. 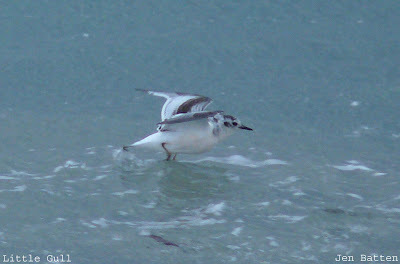 A grey phalarope was in Nouster bay, as were 11 long-tailed duck and 2 red-breasted merganser. Thrushes had decreased today with just 55 fieldfare, 59 redwing and 36 blackbird, 2 stonechat were around Twingness and black redstarts were at the Lurn and Westness. 2 each of robin, goldcrest and chiffchaff were at Holland, where the 3 common redpoll remain. The HUME'S LEAF WARBLER was still present at Bridesness in the morning, and whilst watching this an OLIVE-BACKED PIPIT dropped in calling. It showed for some 15 minutes before heading off towards Stennabreck. 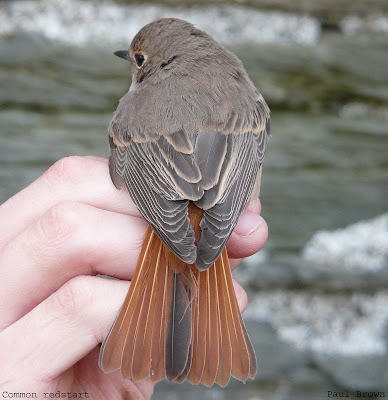 There was limited coverage in the afternoon but thrushes were still in reasonable numbers, a single waxwing flew through and a black redstart was by Gretchen hide. 2 brambling were at Nether Linnay and in contrast to yesterday only 14 woodcock were seen. 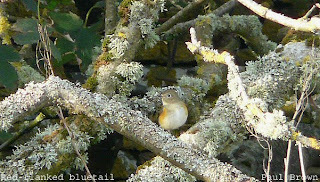 Other migrants included 13 goldcrest, 2 chiffchaff, 2 blackcap and 9 robin. A fantastic day today with a record breaking count of 84 woodcock, and good numbers of thrushes which consisted 221 fieldfare, 156 blackbird, 3 song thrush and 166 redwing. A taiga bean goose flew south along the west coast, 2 black redstart and a chaffinch were new in the north, as was a stonechat at Kirbest. A waxwing was at the Kirk, the blackcap was still at the Observatory and other small migrants included 6 chiffchaff, 17 goldcrest, 16 robin and 4 common redpoll. The bird of the day came in the afternoon when a HUME'S LEAF WARBLER was found at Bridesness - 1st North Ronaldsay record. Despite giving something of a chase the bird finally settled, calling frequently for good measure. Also at Bridesness were singles of short and long-eared owl, whilst the canada goose and 12 barnacle geese were nearby at Greenwall. Another feature of today were large gulls, with flocks by the lighthouse and on the Links consisting of 711 herring gulls and 185 great black-backed gulls. Thrushes were trickling in through the day with final totals of 231 redwing, 112 blackbird, 99 fieldfare and 5 song thrush, and woodcock were well represented with 18. 2 Long-eared owls were in the North, as was the day's highlight with a pallas's warbler at Ires Taing. Other passerines included a black redstart at Garso, 8 robin, 7 chiffchaff, 27 goldcrest and a minimum of 24 waxwing. 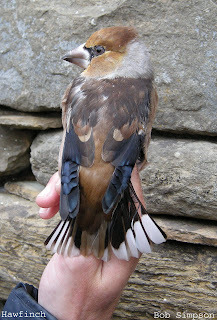 A greenfinch was by the lighthouse, 3 brambling in East Loch Park and 2 lapland bunting by Kirbest. Elsewhere on the island the canada goose remains at Bridesness, 3 jack snipe were at Westness and 47 dunlin in fields with golden plover. Apologies for lack of updates, Internet connection was lost during severe gales on 23rd. October remained quite with strong Westerly winds throughout, though a small arrival of thrushes on 23rd included 360 fieldfare and 200 redwing. The last wheatear was seen on the 26th and white-winged gulls included juvenile glaucous gull on three dates and a juvenile iceland gull on 27th. 8 grey phalaropes on 27th slowly dwindled to just 1 by November, whilst the end of the month produced a maximum of 5 chiffchaff, all of the race abietinus or east of, a late pied flycatcher and 4 common scoter on the sea. Seawatching on 1st consisted of 3 sooty shearwater and a manx shearwater and a juvenile pomarine skua, with a great skua the following day. Also on 2nd were 5 goldcrest, 4 robin, 6 chiffchaff and a count of 125 snow bunting. The 3rd produced an island rarity in the form of a canada goose, and the first woodcock of the autumn. Up to 3 hen harriers and 11 barnacle geese were present through the week and after a few singles a flock of 6 waxwing were in Holland Gardens on 5th. 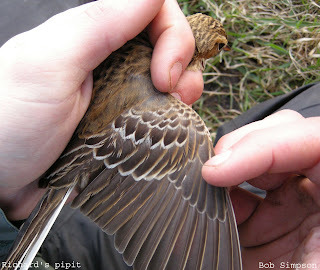 The peak redwing count was of 67 on 5th and a maximum of 6 common redpoll along with 19 twite were noted on 5th. The grey phalarope flock at Bridesness had increased to 10 birds today, with the grey wagtail and little gull also in that area. Greylag goose numbers had been boosted somewhat with a count 1010, with 11 barnacle geese and 3 pink-footed geese amongst them. 22 whooper swan remain, 5 great-northern divers and 2 long-tailed ducks were in Linklet Bay where a juvenile glaucous gull flew through. 2 hen harrier passed through the island in the morning and thrushes consisted of 1 song thrush and 155 redwing. 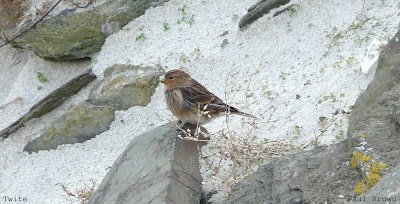 Flocks of 23 twite and 64 snow bunting were in the North. Highlights from a seawatch were 4 common scoter, 3 sooty shearwater and 2 grey phalaropes, with another on Bewan Loch. 371 greylag geese were accompanied by 40 barnacle geese and a white-fronted goose, 200 sanderling on the Links is the highest count of the month and a grey plover was at Haskie. Redwings had increased slightly to 18, the robin, brambling and chiffchaff are still present and a grey wagtail was seen. The robin and chiffchaff remain in Holland Gardens, with the only other notable passerines being 2 song thrush, 4 redwing and a brambling. 13 common scoter were seen on a seawatch, a little gull was on Bewan Loch, 16 whooper swan were on Brides Loch and 7 barnacle geese by the School. A morning seawatch produced just 4 sooty shearwater plus 169 fulmar, 113 gannet and 56 kittiwake. The goosander had moved to Bewan Loch, 38 whooper swan were on Brides Loch and 34 purple sandpiper at Westness is the largest count this Autumn. 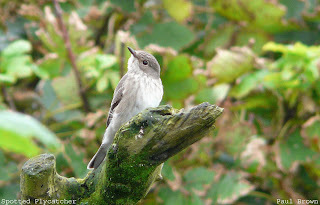 A spotted flycatcher was also at Westness, the chiffchaff was still at Holland and just 4 redwing were seen. 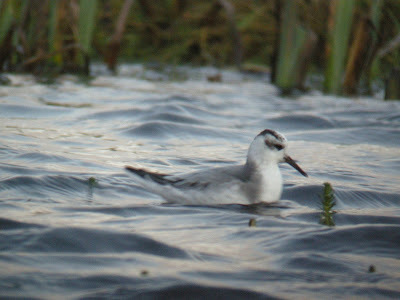 A single twite was at Gravity and a grey phalarope was very obliging at Bridesness in the afternoon. The wind dropped a little today making for a reasonable seawatch, with notable birds being a pomarine skua and 22 sooty shearwaters. Other birds passing included 91 fulmar with a single blue, 101 gannet and 159 kittiwake. The greylag flock in the south had with them 12 barnacle geese and 4 pink-footed geese, whilst other wildfowl consisted of 21 pintail, 24 shoveler, and 8 long-tailed duck, plus 5 red-breasted merganser and the first goosander of the year. A reasonable 91 fieldfare came in through the day along with 73 redwing, though the surprise highlight of the day came late afternoon with a short-toed lark in the stubble field at Nether Linnay. The wet weather and relentless Westerly winds continue, clearly reflected in today's showing of migrants with just 27 redwing, a song thrush, and both the chiffchaff and goldcrest still at Holland. 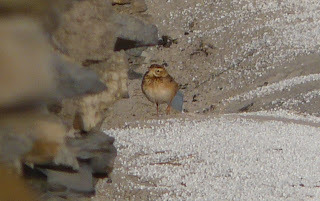 The whinchat was again seen by Trebb, 3 robins were still present and a lapland bunting and 28 snow bunting were seen. Slightly more noteworthy was a scaup in Linklet Bay during the afternoon. A decent arrival of redwing today with 1702, and amongst them were just 33 blackbird, 7 song thrush and 9 fieldfare. The only other new arrivals were a yellow-browed warbler at Rue and 2 sparrowhawk. 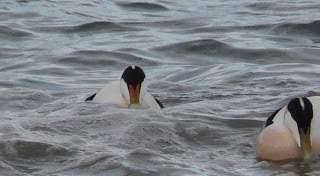 6 red-throated diver, 1 great-northern diver and 4 red-breasted merganser were in Linklet Bay, with a grey phalarope there in the afternoon. A chiffchaff and 2 brambling are still at Holland. 16 twite in the North are the first of the autumn, just 1 brambling remains near Kirbest and 2 lapland bunting were at Nether Linnay. Thrushes included just 19 redwing and 7 song thrush, 2 chiffchaff remain at Holland and 3 each of blackcap and robin were seen. 4 whooper swan flew through in the morning, single red-breasted mergansers were in Nouster and Garso Wick and 2 jack snipe were at Westness. Notable counts of common migrants included 140 ringed plover and 199 snipe. 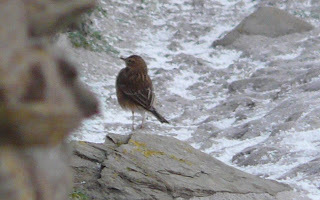 After a week's absence the BUFF-BELLIED PIPIT reappeared sheltering along the stone dyke again by Neven. The few notable new arrivals today were a reed warbler at Westness, spotted flycatcher at Shooting Gallery, chiffchaff at Burray, common sandpiper and swallow at Bridesness and a blackcap in Holland along with the 2 chiffchaff, 2 robin and 2 goldcrest. Thrushes consisted of 4 song thrush, 79 redwing and 46 blackbird, and finches of 1 siskin and 25 brambling. 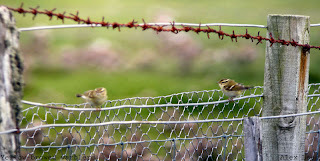 The whinchat was still near Hooking with a lapland bunting there also, and the day's snow bunting tally was 67. 23 whooper swan were on Ancum and greylag geese were again on the move with 715 passing through, whilst barnacle geese had dwindled to just 4. A minimum of 5 merlin were noted with 3 coming in off the sea, the 2 grey plover were at Haskie and 1059 golden plover is the highest count so far this month, as was snipe with 178. Geese were heading south in the morning with 105 barnacle geese, 54 pink-footed geese and 146 greylag geese, whilst other wildfowl today included 20 whooper swan on Ancum Loch and a long-tailed duck in Linklet Bay. Also in Linklet Bay were 2 red-throated diver and 2 great-northern diver, with another 2 of the latter in Nouster Bay. Remaining from yesterday were 10 brambling, a siskin and a chiffchaff, though a few new migrants had appeared with a whinchat near Hooking and a ring ouzel at Westness. Thrushes were coming in off the sea in the afternoon with a final count of 160 redwing and 3 song thrush, whilst robins had increased to 4 and snow bunting to 162. 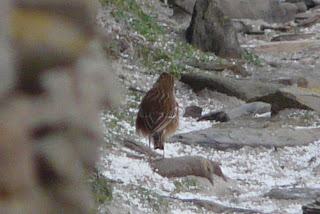 Also seen today were a jack snipe by the Observatory, 2 grey plover at Bridesness, 5 wheatear and a hen harrier. 52 barnacle geese were still at Nether Linnay and 2 grey plover were on the Links. 2 swallows flying through were of note, snow buntings reached a total of 80 today and still in Holland gardens were the chiffchaff and robin, and singles of redwing and song thrush. 14 brambling were in the stubble field at Kirbest, 2 Greenland redpoll at Howar and 2 siskin were seen at Westness. Still quiet with unfavourable birding conditions, however there were a couple of island scarcities today which included a velvet scoter passing on a seawatch hide, 4 pale-bellied brent geese toured the island and to a lesser degree a grasshopper warbler was amongst the irises at Viggay. A blackcap and a chiffchaff were at the Surgery, with another of the latter still at Holland where 2 robin remain. Still at Nether Linnay are 54 barnacle geese and 106 greylag geese. A Greenland redpoll is at Greenwall, a grey plover is at Stennabreck and thrushes seen today were just 1 redwing and 5 song thrush. 2 red-throated diver were in Nouster Bay, a total of 58 snow bunting were seen and purple sandpiper are still in strangely low numbers with just 7. Remaining migrants are still in similar numbers with 4 robin, 3 goldcrest, a chiffchaff, and 9 each of redwing and song thrush, though a whinchat at Bridesness was new. A total of 5 brambling, 67 snow bunting and a single redpoll were also seen. 128 eider is the highest count since early spring and other wildfowl counts included 90 wigeon, 17 gadwall, 101 teal, 34 mallard, 7 shoveler, 3 tufted duck and single goldeneye and pintail, whilst 72 barnacle geese are at Nether Linnay. A handful of new arrivals included 2 blackcap, 2 robin, a spotted flycatcher and a Greenland redpoll at Holland. 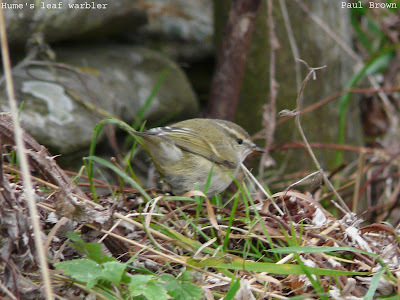 Also there were the chiffchaff and 2 goldcrest, with another of the latter at Scots Ha. A grey wagtail was on the airfield and thrushes today were 46 redwing, 18 song thrush and 13 blackbird. 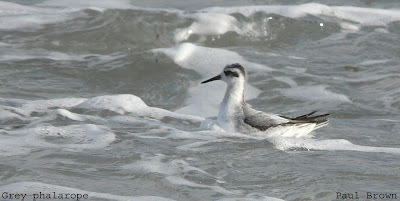 A grey phalarope was again seen from the seawatch hide and a long-tailed duck was also seen. 7 whooper swan are on Ancum Loch, 61 barnacle geese still at Nether Linnay with 96 knot and a single swallow was by the pier. Other bits included 3 wheatears, 2 great-northern divers, a hen harrier and a grey plover. A small arrival of thrushes was evident today consisting mostly of redwing with 85, plus 2 song thrush and a fieldfare. Also new were 2 brambling, whilst remaining were the chiffchaff and 2 goldcrest at Holland. A grey phalarope was seen on a seawatch and a flock of 60 barnacle geese and a brent goose were at Nether Linnay. The family of 4 whooper swan were still on Ancum Loch with 11 gadwall and a hen harrier also there. Counts from just over two hours seawatching consisted of 3670 fulmar - including 14 blue, 20 sooty shearwater, 11 manx shearwater, 269 gannet, 186 kittiwakes and a grey phalarope. 6 whooper swan were on Ancum Loch and 73 barnacle geese flew thorugh, whilst a less than annual slavonian grebe was in Nouster Bay. The few other migrants seen today were a blackcap at Bridesness, 3 redwing, a song thrush, a goldcrest and 16 snow bunting. Despite reportedly looking rather bedraggled in yesterday's wet weather, the BUFF-BELLIED PIPIT was still present for its third day around Nevan. A yellow-browed warbler was seen at Sandback, single redwing at Hooking and Quoy Banks and in Holland were a chiffchaff and a goldcrest. 4 ruff were by the Mill, a grey plover was on the Links and the hen harrier was around Loch Park in the morning. A minimum of 31 snow bunting were seen and a flock of 14 barnacle geese flew through. 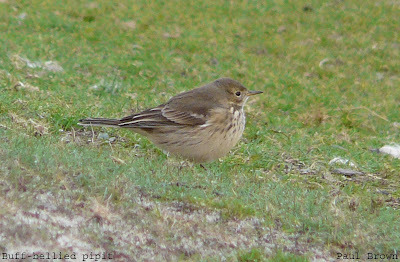 The BUFF-BELLIED PIPIT was still on the golf course by Nevan through the morning, with a lapland bunting also there. 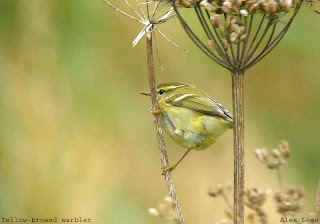 In Holland were 2 goldcrest and a willow warbler, with 2 lesser whitethroat and a redwing seen elsewhere on the island. 3 snow bunting were on the Lurn and 2 barnacle geese flew through with 89 greylag geese. What looked set to be another quiet day was soon livened up with the discovery of a BUFF-BELLIED PIPIT at Neven early afternoon - first for Orkney. The few other migrants recorded were a goldcrest and chiffchaff at Holland, 22 snow buntings and 2 song thrushes. Wildfowl counts for today were a family of 4 whooper swan, 57 greylag geese, 42 wigeon, 7 gadwall, 102 teal, 75 mallard, 2 shoveler and 7 pintail. The first white winged gulls appeared today with an adult glaucous gull at Lindswick and a juvenile iceland gull over Nether Linnay, whilst snow buntings had increased to 27. A hen harrier was in the North were 127 knot were at Lindswick and 2 jack snipe at Westness. Common passerines included 2 goldcrest, 2 robin, 8 redwing and singles of willow warbler, chiffchaff and garden warbler at Holland and a blackcap was near Bewan, and a pectoral sandpiper was on the loch there. The only notable sea passage was of 7 sooty shearwater. Very little today but seawatching did produce 2 little auk and a juvenile sabines gull as well as 6 sooty shearwater. 15 pink-footed geese flew south, wheatears have dropped off to just 4 whilst thrushes included 11 redwing and a song thrush. 4 snow buntings were on the Lurn. The 3rd first for North Ronaldsay in less than two weeks appeared today in the form of a first winter SPOTTED SANDPIPER in Kirbest Mire. Presumably present since the 28th, as an Actitis sandpiper thought likely to have been this species was briefly seen on Gretchen Loch. Elsewhere the few remaining passerines were a blackcap at the Surgery, willow warbler at Breck, 2 Robin, a goldcrest and a chiffchaff were in Holland and 3 snow bunting and a lapland bunting were seen. 2 grey plover were at Bridesness, 74 knot were at Nether Linnay and an arctic tern was seen form the North end. 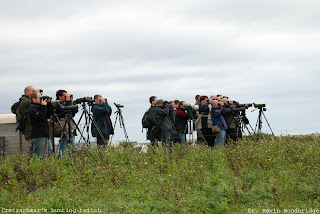 Without doubt the quietest day of September, with regular heavy showers contributing to a poor day's birding. 5 red-throated diver were in Haskie Bay, 4 grey heron were still in Garso Wick and just 17 pink-footed geese were seen flying south. At the North end 2 little stint remain on Bewan and seawatching provided 290 fulmar and 17 sooty shearwater. 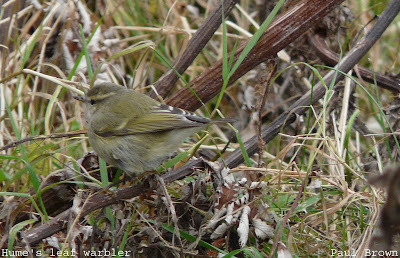 A yellow-browed warbler was at Hooking, 5 chaffinch and 2 goldcrest in Holland and 2 chiffchaff were noted. Raptors present included 3 merlin and a hen harrier. 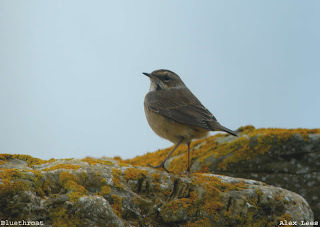 The bluethroat is still at Westness and a new yellow-browed warbler is at Scottigar. A chiffchaff was by Gretchen hide, 2 blackcap and a goldcrest were in the gardens at Holland and a robin was at Purtabreck. A count of 39 blackbirds is the highest of the month and other thrushes included just singles of song thrush and redwing. A whooper swan and 76 pink-footed geese flew through and seawatching produced 22 sooty shearwater, 572 fulmar and 2 commic terns. 2 pectoral sandpipers spent the day on Gretchen Loch, with a scaup dropping in there breifly late afternoon. 5 ruff were amongst the golden plover in Mid Park, the 2 little stints were still on Bewan Loch and a minimum of 2 hen harrier were seen. Strong winds made veiwing in Holland gardens difficult but the red-flanked bluetail appears to have moved on, as have most migrant passerines. Those that were seen included 17 wheatear, lesser whitethroat, 2 goldcrest, blackcap, song thrush , 2 common scoter flew past the seawatch hide and 511 pink-footed geese flew through. 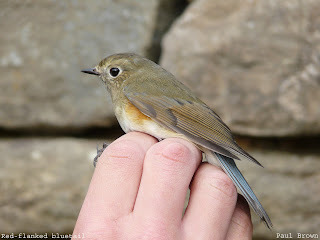 Still quiet in terms of numbers but the RED-FLANKED BLUETAIL was still in the Sycamores at Holland, the bluethroat remained at Westness and 5 yellow-browed warblers were dotted around the island. Leftovers included the turtle dove and flava wagtail in the North and the curlew sandpiper was on Bewan Loch with 3 little stint. Also seen were 2 robin, 11 redwing, 5 song thrush, 2 blackcap, 2 goldcrest, 2 chiffchaff and singles of lesser whitethroat, tree pipit and garden warbler. The only new migrants today were a black redstart and 544 pink-footed geese flew south. 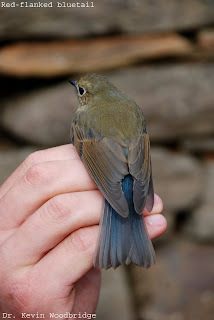 Today's highlight was undoubtedly a 1st winter male RED-FLANKED BLUETAIL seen in Holland gardens early afternoon and trapped shortly afterwards, this represents the 1st record for Orkney. 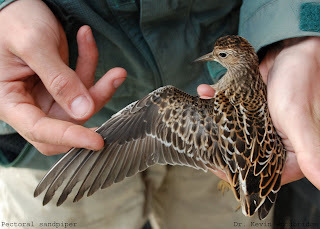 A pectoral sandpiper reported on Gretchen Loch yesterday was confirmed there today in the company of a curlew sandpiper, and other notable waders included a grey plover, a common sandpiper and 2 little stints. The bluethroat and flava wagtail were still at Westness, just 3 yellow-browed warblers remain but a common rosefinch at Nether Linnay was new. Other migrants were still in low numbers with 28 redwing, 5 song thrush, 19 wheatear, 4 blackcap, 3 goldcrest, 2 robin and singles of garden warbler, spotted flycatcher and pied flycatcher. Both the collared dove and turtle dove were seen again and 3 crossbill were at Holland late afternoon. Numbers of wildfowl on the island include 44 pink-footed geese, 59 greylag geese, 62 mallard, 156 teal, 2 tufted duck and 4 pintail. Yellow-browed warbler was todays commonest warbler with 15, others including 6 blackcap, 3 willow warbler, 2 chiffchaff, a lesser whitethroat, a reed warbler and the barred warbler was re-trapped at Holland. 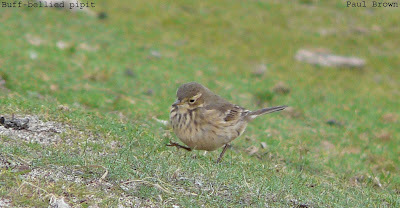 A bluethroat was at Westness and redwing are starting to appear in increasing numbers with 41 today. 2 pied flycatcher were trapped at Holland were 2 goldcrest, a robin and a song thrush were also seen and a turtle dove was at nearby Kirbest. 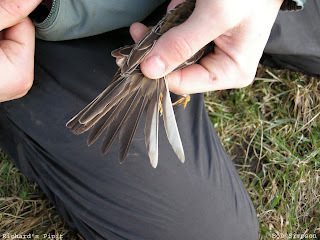 In the North a flava wagtail was by Longar, a short-eared owl at Rue and a collared dove at Midhouse. Single great-northern and red-throated divers were in Nouster Bay, waders of interest included 16 black-tailed godwit and 2 grey plover and 3 peregrines were seen. A disappointingly quiet day with a yellow-browed warbler and a passage of 297 pink-footed geese the most noteworthy sightings. Holland held the majority of migrants with 4 robin, a lesser whitethroat, 2 goldcrest and single chiffchaff and willow warbler. 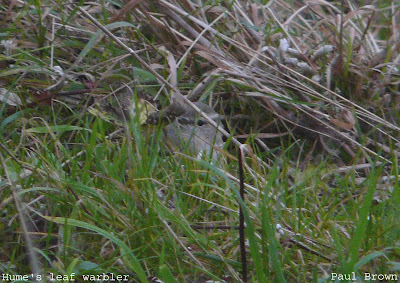 A reed warbler was seen at Bridesness as were 2 grey plover and 2 red-breasted merganser. 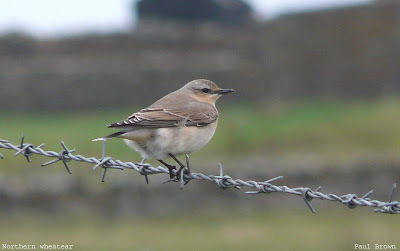 A tree pipit was at Westness, singles of siskin, sand martin and snow bunting flew over and just 6 wheatear were logged. Despite continued searches through the day the cretzschmar's bunting appears to have moved on, as did the majority of common migrants. What was left over were 3 whinchat, 27 wheatear, 5 blackcap, 2 lesser whitethroat, 3 goldcrest, 2 white wagtail, a song thrush, a spotted flycatcher and a snow bunting. 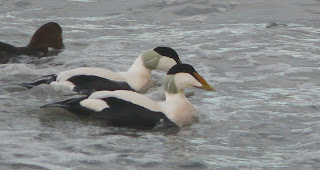 The hen harrier was seen again in the South, a yellow-browed warbler remained at Holland and 5 red-breasted merganser were seen in the North. A whimbrel was by the airstrip, just 4 little stints are present on Bewan Loch and other wader counts today were 28 bar-tailed godwit, 20 dunlin, 5 purple sandpiper, 92 knot and 410 golden plover. The male CRETZSCHMAR'S BUNTING was still at Sangar first thing feeding on grain along the track, later flying West and worryingly lost by North Manse late morning. 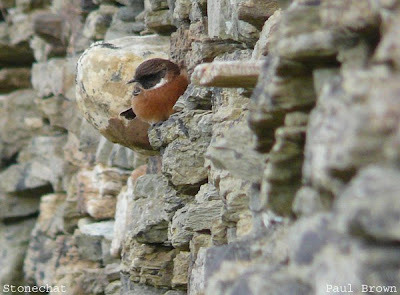 Thankfully the bird was re-found in the afternoon nearer Ancum, before heading back to Sangar and again enjoyed by all. With the Observatory staff's efforts concentrating on the cretzschmar's bunting, island coverage was understandably limited. The 5 little stints are still on Bewan Loch, , at least 3 kestrel and the turtle dove remain on the island and other bits and pieces included 2 tree pipit, 5 redstart, 5 whinchat, 5 blackcap, 1 garden warbler, 1 spotted flycatcher, 4 willow warbler, 2 chiffchaff, 7 song thrush, a lesser whitethroat and a reed warbler. New arrivals today were singles of brambling and snow bunting, 5 redwing, a green sandpiper, sand martin, hen harrier, 4 goldcrest but most noteworthy was the appearance of 4 yellow-browed warblers arriving from mid afternoon. 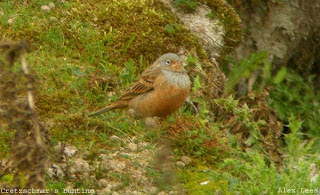 The CRETZSCHMAR'S BUNTING was still at Sangar at first light, remaining in the general area throughout the day and eventually 'ticked' by all arriving by plane or boat. With most of the day spent sorting transport and tracking the bunting, there was very little coverage elsewhere on the island. The few birds that were noted included a juvenile red-backed shrike by the Observatory, 1 swift, 1 redstart, 3 song thrush, 2 spotted flycatcher and 1 pied flycatcher and 85 chaffinch. The first whooper swans of the Autumn flew south along the East coast followed by 34 pink-footed geese, a jack snipe was seen at Ancum Loch, 280 sanderling were roosting on the Links and 2 arctic terns are still hanging on in Nouster Bay. 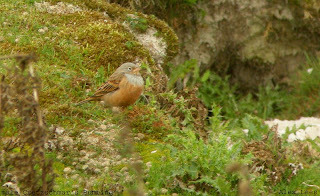 An adult CRETZSCHMAR'S BUNTING is at Sangar. 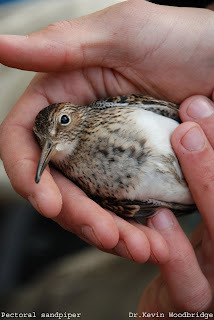 For Loganair flights from Kirkwall to North Ronaldsay phone 01856 873457, or for ferry services contact Orkney Ferries on 01856 872044 For North Ronaldsay Bird Observatory accomodation contact Alison on 0185 7 633200. A male hawfinch was trapped at Holland in the morning and yesterdays juvenile pectoral sandpiper had settled on Bewan Loch with 7 little stints. An osprey spent the morning in the North and other birds of prey were a sparrowhawk, a merlin and a minimum of 4 kestrel. 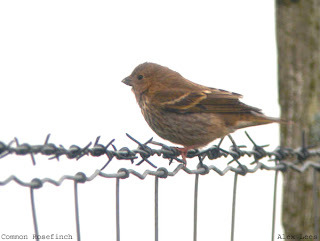 A common rosefinch at Holland was later by the Mill and an icterine warbler was nearby at the School. A new barred warbler appeared in the irises at Westness were a short-eared owl and a swift were also seen. The turtle dove was seen again in the North whilst a common sandpiper remained in the South. Common migrants still present included 34 willow warbler, 14 garden warbler, 13 blackcap, 3 whitethroat, 2 lesser whitethroat, 20 whinchat, 22 redstart, 2 tree pipit, 26 song thrush, 10 pied flycatcher, 6 spotted flycatcher, 19 robin and 4 goldcrest. 51 chaffinch were feeding in the stubble field at Nether Linnay and other finches were singles of crossbill, meally redpoll and siskin. 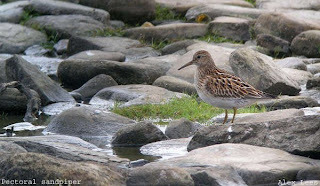 At mid day a pectoral sandpiper was seen at Hooking, flying over to Bridesness but disappeared shortly afterwards. The barred warbler remained at the airfield and redstarts rose again to 41, with whinchat numbers also increasing slightly to 16. Wheatears were in abundance with a good count of 113, a flava wagtail was again in the North, a short-eared owl was flushed from Gretchen and a wood warbler was by the Mill. Elsewhere day totals were 28 song thrush, 16 robin, 50 willow warbler, 24 pied flycatcher, 12 spotted flycatcher, 13 garden warbler, 10 blackcap, 2 whitethroat, 2 lesser whitethroat, 5 goldcrest and singles of chiffchaff, reed warbler and sedge warbler. 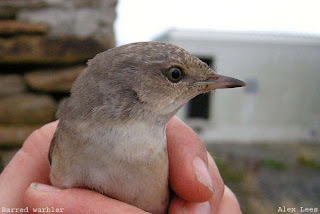 A wryneck and an icterine warbler remained at Westness, with another of the latter at Gravity. A single flava wagtail was seen in the north, a grasshopper warbler by the lighthouse and a short-eared owl was seen coming in off the sea at Garso. Most migrant numbers showed little change with 31 redstart, 14 whinchat, 9 tree pipit, 14 spotted flycatcher and 12 pied flycatcher. A barred warbler on the airfield was new, and a chance to open the mist nets at Holland boosted warbler numbers somewhat with totals of 43 willow warbler, 31 blackcap, 14 garden warbler, 4 lesser whitethroat, 3 whitethroat, 5 reed warbler and single of chiffchaff and sedge warbler. 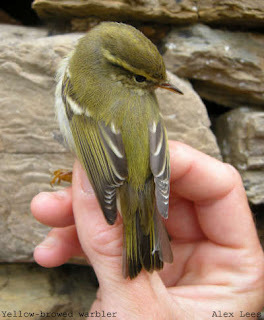 The first 3 yellow-browed warblers of the autumn appeared in the afternoon with birds at Twinyas, Gretchen and Gravity. The common rosefinch was still at the Observatory, a house martin and a swift were seen over and other counts included 21 robin, 29 song thrush, 4 goldcrest and 2 siskin. The 2 little stints at the North end were joined by a 3rd, a greenshank was seen and a jack snipe was flushed from Brides Loch. The icterine warbler remained at Westness and both common rosefinches were still present at Burray and the Observatory. Chaffinch numbers had risen to 115, mostly in the Nether Linnay area, but little change elsewhere and seemingly little in the way of new arrivals. 3 flava wagtails were still at the North of the island, the turtle dove was seen again at Westness and a lapland bunting was with house sparrows at Holland. Warblers today included 4 whitethroat, 6 lesser whitethroat, 3 reed warbler, 24 blackcap, 22 garden warbler and 37 willow warbler. 5 kestrel was definitely a conservative count, redstart remained in good numbers with 38, and other migrants tallied up at 16 robin, 28 whinchat, 28 song thrush, 13 spotted flycatcher and 18 pied flycatcher. 912 golden plover is the highest count this month, a fieldfare was at Kirbest and 2 common sandpiper were seen. Slight decrease in numbers today but still excellent birding. Scarcities left over from yesterday were a wryneck at Nether Linnay, icterine warbler at Westness and common rosefinch by Burray, with a new common rosefinch by the caravan at the Observatory and a barred warbler at Nether Linnay was new. Redstart remained as the commonest notable migrant with 58, at least 2 flava wagtails were still present and a wood warbler was at Ancum. Other counts included 23 robin, 23 whinchat, 34 song thrush, 51 willow warbler, 21 pied flycatcher, 16 spotted flycatcher, 24 garden warbler, 8 blackcap, 9 tree pipit, 5 goldcrest, 4 lesser whitethroat, 2 whitethroat and 2 sedge warbler. The grasshopper warbler was still present at the Lighthouse, an extra reed warbler on yesterday took the total to 5 birds and a redwing was at Sandar. Finches are on the increase with 49 chaffinch and 16 siskin at Nether Linnay, a woodpigeon was seen in the south along with a sparrowhawk and minimum of 4 kestrel were seen. Just 1 little stint could be found at the North end and a common sandpiper was on the shore at Twingness.